Michael Valentine, veteran and former member of an elite private military company, has been recruited by the government to conduct a secret counter-terror operation in the Persian Gulf nation of Zubara. The unit is called Dead Six. Their mission is to take the fight to the enemy and not get caught. Lorenzo, assassin and thief extraordinaire, is being blackmailed by the world's most vicious crime lord. His team has to infiltrate the Zubaran terrorist network and pull off an impossible heist or his family will die. A knight of Cygnar follows a strict moral code. His integrity is beyond reproach. He holds himself to the highest standards whether dealing with friend or foe. And he values honor above all. The year is 606 AR, and Cygnar has been sorely pressed by its enemies both at home and abroad. In Caspia, the conflict with the Protectorate is about to erupt into full war with the looming invasion of Sul. The Cygnaran military is desperate for soldiers with the skill, strength, and bravery to take up the devastating galvanic weaponry of the new Storm Division. After 150 titles, first review of a fantasy story. A pyramid predating all known cultures appears without warning. Its discovery throws into question everything we know about the origins of mankind. Inside lies incredible technology, proof of a culture far more advanced than our own. Something dark lurks within, eager to resume a war as old as mankind. When it is unleashed, it heralds the end of our species' reign. Narrated by: Thomas Stephen Jr. Conducted under the umbrella of Project Gunrunner, intended to stem the flow of firearms to Mexico, the Bureau of Alcohol, Tobacco, Firearms, and Explosives (ATF) ran a series of “gun walking” sting operations, including Operations Wide Receiver and Operation Fast & Furious. The government allowed licensed gun dealers to sell weapons to illegal straw buyers so that they could continue to track the firearms as they were transferred to higher-level traffickers and key figures in Mexican cartels. Accountant turned professional monster hunter Owen Zastava Pitt managed to stop the nefarious Old Ones' invasion plans last year, but as a result made an enemy out of one of the most powerful beings in the universe. Now an evil death cult known as the Church of the Temporary Mortal Condition wants to capture Owen in order to gain the favor of the great Old Ones. The Condition is led by a fanatical necromancer known as the Shadow Man. The government wants to capture the Shadow Man and has assigned the enigmatic Agent Franks to be Owen's full-time bodyguard, which is a polite way of saying that Owen is monster bait. 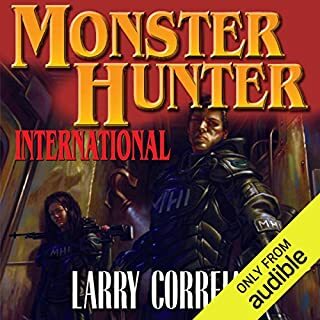 With supernatural assassins targeting his family, a spy in their midst, and horrific beasties lurking around every corner, Owen and the staff of Monster Hunter International don't need to go hunting, because this time the monsters are hunting them. Fortunately, this bait is armed and very dangerous. 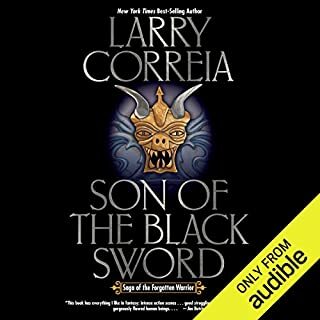 ©2010 Larry Correia (P)2011 Audible, Inc. The "Monster Hunter" series is something that your sane voice is telling you to hate, but the sheer ridiculousness of the story coupled with the over-the-top machismo and cheesiness somehow overrides that voice. In the end, you find yourself thoroughly enjoying the ride and groaning as required. This book is like a comic book sans art work. What is fun is how the author has liberally pulled upon other references (think H.P. Lovecraft, Bram Stoker, etc.) and brought them along for the ride. The second book in the series, it did a good job of continuing the story from the first book. Although this book could stand on it's own, you'll be much better situated if you start with book one. In summary. if you have a good sense of humour and can tolerate ridiculous situations and dialogue, you will enjoy this book. If this isn't your cup of tea, then avoid this series. I'm just crazy enough to have found it very enjoyable. What did you like best about Monster Hunter Vendetta? What did you like least? The main characters were quite engaging and it was nice to meet more family members (this is book 2 after all) but every time a real problem occurred more improbable powers appeared and it just got silly. 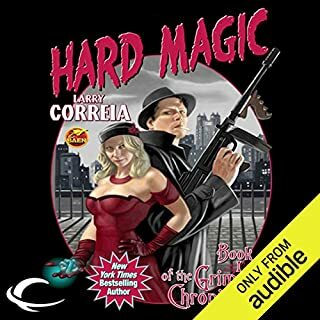 Would you ever listen to anything by Larry Correia again? 2 books have been fun, mostly, but enough is enough. This is such a boys annual for adults book. Lots of shooting, slashing, car crashes and a hero who is totally indestructible to the point where he survives what no human being before him has survived. Oh, and he is the only hope for the future of the human race. I usually don't have too much trouble suspending belief in fantasy novels but this tested me. However, if you love pure action and impossible heroes, you'll love this book. If you could sum up Monster Hunter Vendetta in three words, what would they be? The villain in this story is great. He's cunning and powerful and, most importantly, understandable. He's a fantastic example of a man driven to evil, rather than being evil for evil's sake. His motives are clear and his means are ruthless, he was a fantastic character. Have you listened to any of Oliver Wyman?? ?s other performances before? How does this one compare? This one continues the excellent quality of the first Monster Hunter book, with Oliver bringing Owen to life. Sometimes, the end justifies the means... but an automatic shotgun always means the end to something. This is a great sequel to a fun first book. I look forward to the next book in the series. What made the experience of listening to Monster Hunter Vendetta the most enjoyable? Larry has great ideas and makes action fun to listen to. Just to much time is wasted with Owen being petty and argumentative. There were times I just had to stop listening, it was so painful. The arguing doesn't seem to do anything for the story, it slows down the narrative and it's just irritating to listen to. What about Oliver Wyman’s performance did you like? He makes the book sound like it's peopled by a multitude of different, distinct voices. I think I laughed a couple of times. I would have loved the book so much more without the silly school yard bull poo. The author doesn’t mess around in this one, before second chapter he goes straight into the action of the plot. Setting a heavy precedent. ok series so far. not in the same universe as the hard magic series as far as quality. I can hardly believe the same guy writes both series. 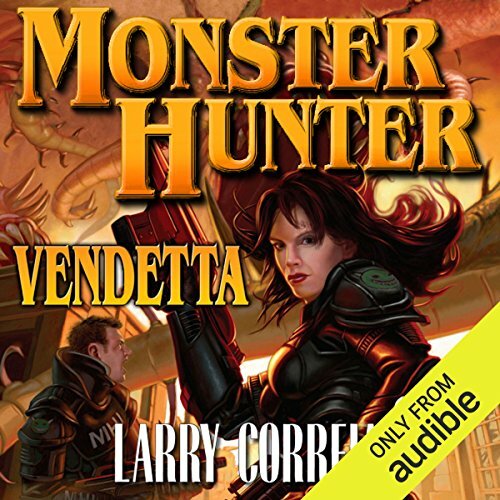 Has Monster Hunter Vendetta turned you off from other books in this genre? No. It's not all that bad. It's a pulpy action book. It just could have been set in a highschool based on the trite interactions and relationships of the characters. What aspect of Oliver Wyman’s performance would you have changed? Could you see Monster Hunter Vendetta being made into a movie or a TV series? Who should the stars be? 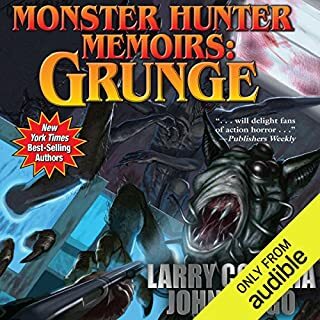 The first Monster Hunter book was quite a tour de force, a highly original-feeling story chock full of humor, insane action sequences, and epicness. The sequel gives you more of the same - which may satisfy those craving more of such, but for me it's starting to get a bit repetitive. The plot picks up where the first left off, which is something I wasn't too keen on. Correia tries to up the stakes in every possible way, when I thought he had reached too far in the first volume. This results in what feels like a kitchen-sink mentality, where he tries to tie everything together (feeling like ret-conning at times), creating ridiculous situations for the heroes to try and escape from. The result is long, frustrating sequences that seem to be drawn-out for the intent purpose of creating more tension and upping the stakes. Then Correia has no choice but to resort to lots of deus ex machina moments in order to bail the heroes out of said situations. Perhaps with this book the initial plotline is over, although it sounds like he's going to continue it, with lots of foreshadowing and prophecies yet to be fulfilled. Although there are elements I like to the story and his writing, I'm not sure if I want to continue any further if we are to follow the same (now old-feeling) plot line. 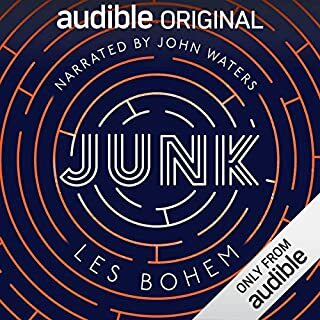 I enjoyed every minute of listening to this book. The writer is sometimes violent yet funny. Like Harry Dresden of the Dresden files, the character is sarcastic, flawed and definitely an anti-hero. The narrator Oliver Wyman is amazing, really. His voice intonations and characters are funny, dramatic and truly believable. He really actuates the book. The first book is a warm up to this one. I say, go for it. If you like vampires, werewolves and other demons, you'll enjoy this true action adventure. I haven't been sucked into a book so strongly for a damn long time. 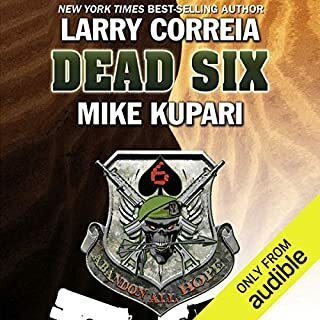 Larry, you're officially one of my favourite authors, your writing, story telling and character development are ace, with blockbuster action, twists, and down right vivid wordplay I watch the events unfold in my head in such a way that I'm glued to my headphones and can't get enough. The other major factor for my not getting enough of the monster hunter series is down to Oliver wyman's delivery of the novel, clear speech and well delivered voice acting bring the world and characters to life with brilliant vibrancy down to Olivers delivery of Owen he is now etched into my mind as one of the most badass heros out there. Thanks guys, these books are awesome! And are currently the major bulk of my audible library haha! After the first book, "Monster Hunter International", I knew I'd be in for a treat and was not disappointed. The prequel was really good, pity ratings only go to 5 a really great monster battle of a book. I bought this for something a book different and based upon reviews, I was instantly hooked, the story and narration is amazing. If you like monster and can suspend all disbelief you'll absolutely love this book. Brilliant development from the first MHI. Still too heavy handed on the gun specifics (this man REALLY loves his guns!) but otherwise fantastically entertaining listen. Would highly recommend for anyone who loves b movie camped up hyper violence. Loved it. Enjoyed the narrator. I have already downloaded the second book in the series. I thoroughly enjoyed this book, as I have the others in this series. It was also well narrated with the exception of the narrators awful attempt at an English accent! Which character – as performed by Oliver Wyman – was your favourite? Wasn't sure what to expect with the first book - but have been dragged into the series and am getting a feel for the characters, have just started book 4, so they can't be that bad. This series just keeps getting better and better . This narrater is something special! .. just how many voices can he do! .. just when you think he can't possibly do a voice he pulls it out the bag! Looking forward to the next one . I love this series,listened to it numerous times. the characters are great and it's full of warmth and humour as well as monsters. the only criticism is that although the narrator is generally very good, he really struggles with doing foreign accents especially English ones but that is a small complaint. With more monsters and fantasy creatures this story starts to flesh out the series with many edge of seat moments. Great 2nd book to a great 1st book. Loved it. Looking forward to the third book. Very enjoyable, an original story, lovecraftian elements, I loved nearly every minute of it, the one downside was some abstract silliness that for me personally detracted from the story as a whole. Still one of my favourite book series to date.